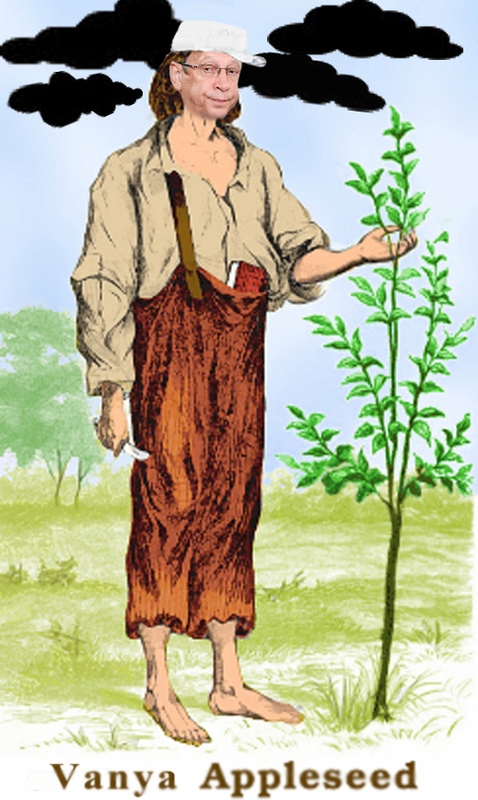 Johnny Appleseed, an eighteenth century nurseryman and orchardist, is honoured in his American homeland for being a patriotic soldier in the war against the British, and for going barefooted in the mission of Jesus Christ to convert the native Indians, whose tribal lands he enriched with apple nurseries. It’s the job he did for apples that has given him his nickname. When he died, his estate amounted to 490 hectares of apple orchards. What is less well-known is that because grafting was against Johnny’s religious conviction, the apples he produced were prone to disease and good only for pressing into alcoholic cider, sauce for roast pork, and baked apple-pies. In Russia the first two are unheard of. Porvidlo (Повидло) and charlotte (Яблочная шарлотка), puree and pies, are the next best thing, applewise. Following publication of last week’s report on apple scams in Russia, it has been discovered that one well-known figure leads the other Russian oligarchs in the business of apple-growing. Vladimir Yevtushenkov (lead image) is normally recognized as the owner of the MTS telephone company; the former owner of the Bashneft oil company; and employer of Lord Peter Mandelson for public relations purposes. Yevtushenkov has also been the recent business friend of South African President Jacob Zuma, the story of which can be read here. Yevtushenkov’s Sistema congomerate includes a company called Steppe Agro Holding. This combines a land bank for wheat and other grain crops; dairy herds; vegetable greenhouses; and two fruit farms, Trudovoye and Sad Kubani (“Garden of the Kuban”), which specialize in apples. The latest Sistema report says the holding’s orchards reached 780 hectares by the end of 2016. The gross apple output, according to the 2016 annual report, was growing at a rate of 5% per annum, and reached 15,900 tonnes for last year. The orchard yield was also up 5% on the year at 42.1 tonnes per hectare. With results like these, Yevtushenkov should be running close to, even ahead of Bekhan Hamchiev, owner of Sad Gigant. 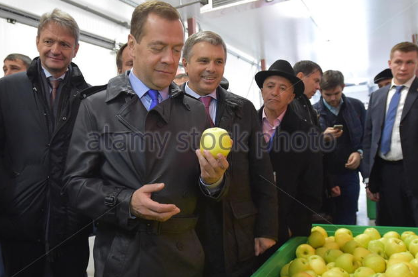 Apple industry reports identify Sad Gigant as the Russian apple leader, a status Prime Minister Dmitry Medvedev (pictured below, centre) confirmed by visiting the farm in Ingushetia, accompanied by the Minister of Agriculture, Alexander Tkachev (left), last October. According to figures circulating in the fruit business, Hamchiev produced 12,000 tonnes of apples in 2016; that’s almost 4,000 tonnes less than Yevtushenkov. But here’s a curiosity. Sad Gigant refuses to confirm the production data or the comparison with Sad Kubani. Neither will the Russian Association of Fruit and Berry Producers (ASPRUS), which regularly issues its list of the top Russian apple growers; the hectare area of their orchards; the output tonnage and yield per hectare. All such lists omit Yevtushenkov’s farms. Yevtushenkov’s spokesmen and the Steppe Holding also refuse to clarify their standing in the Russian apple table.